« Fermentation on Wheels in Oakland! 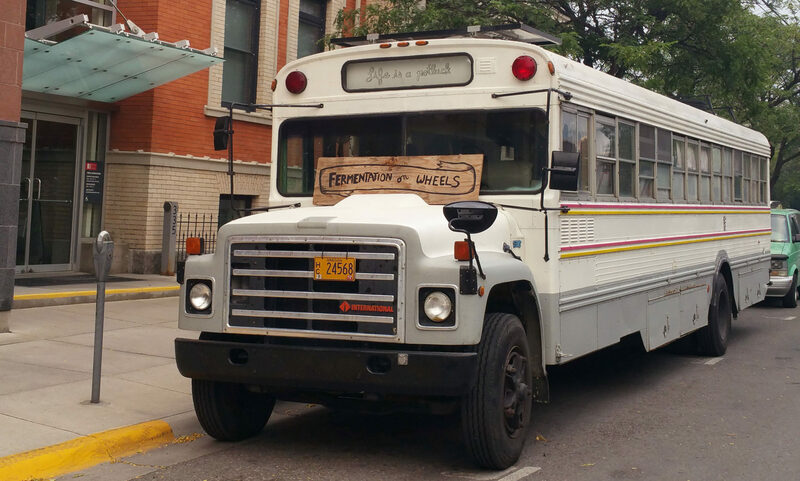 Fermentation on Wheels –the book and the adventure–was born in Oregon’s Willamette Valley in May 2013 when author Tara Whitsitt converted a forty-foot vintage military bus into a fermentation lab and workshop. Since then, she’s travelled over 24,000 miles with a mission to bridge communities, inspire sustainability, and teach fermentation. With her new illustrated memoir/cookbook, Tara shares road stories and recipes–from the generous farmers who offered respite and fermentables, to young arms baptized elbow-deep in salty cabbage, and to fifty unique recipes of delectable fermentations learned and created while on the road. After her book discussion, discover the simple tradition of preservation through bacterial collaboration in one of its most simple forms: via the local micro-flora of vegetables! Fermented foods heal our bodies, celebrate age-old traditions, and promote healthy eco-systems. Taste a variety of ferments from the bus and featured in the book, then learn about the cost effective and simple tools involved and go home knowing how to creatively and fearlessly ferment vegetables with this hands-on demonstration.